Students often are charged with the task of creating review articles. It is necessary to understand what the essence of this activity is. Such type of work consists in analyzing the publication from the perspective of various aspects, such as consistency, novelty, uniqueness, the use of a suitable style, proper format, etc. 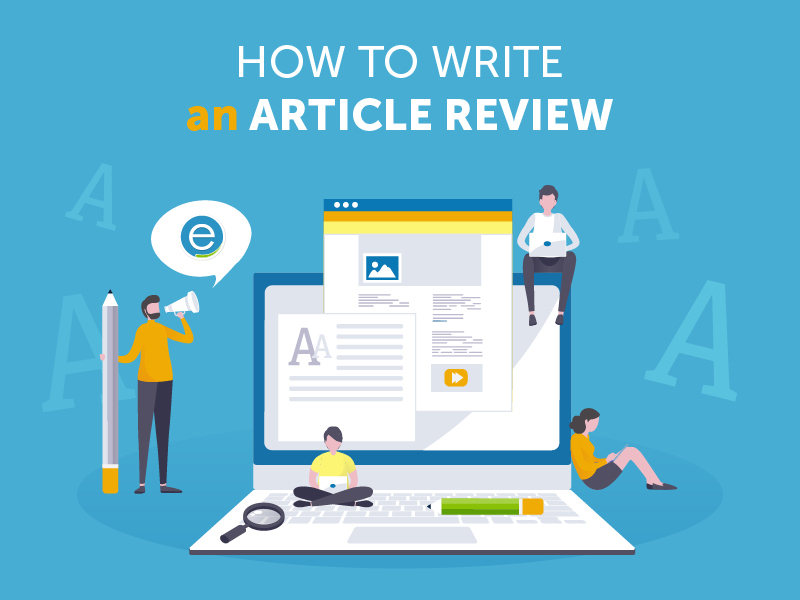 Many students ask: «How to start an article review?» It is recommended to start a holistic analysis of the text and gradually move to exploring the details. The main feature of a successful scientific publication is its consistency. Read the work; think about whether all paragraphs are interconnected in meaning. If you notice any inconsistencies in the text, study them in your review. It is known that the main purpose of creating an article is to disseminate some new scientific information. For example, a scholar made a new discovery and wanted to share it with the entire scientific world, or one more example, a graduate student found an alternative approach to solving some scientific issue. If the publication you are examining does not contain anything new, it cannot claim to be successful. The article is not just retelling of someone's words; the author must show his or her personal contribution to solving issues. The main feature that differs scientific literature from the art is its clarity. The author of the article should not make a lot of digressions, he or she needs to write briefly and informatively. If the text of a poem or novel requires a variety of speech techniques, then the scientific speech should be simple and strict. When analyzing a scientific text, special attention should be paid to facts and evidence. They are the basis of any study. If a scholar has found a new interesting idea, he or she must confirm this theory with reliable evidence. Check whether the arguments presented in the article are reliable. The writer should build his or her evidence base on the works of reputable scientists. As mentioned above, scientists should provide examples from other scientific publications in their work. However, based on this, there is another need; this is the demand for a correct citation of the text. Remember, the writer cannot just retell someone's thoughts. It can be perceived as plagiarism. The author must be able to create quotes properly. Check whether the citations presented in the analyzed text are correct. As is known, a scientific publication must be formatted according to some rules. Each academic writing style has its own standards. The reviewer should be familiar with each of them. In addition, there are several universal rules that must be followed by the authors. For example, the most important of them say that the text should be divided into paragraphs and important, key concepts should be written in bold or italic. Such text formatting techniques help to make an article more readable and easy for the audience to perceive. Proper, competent speech is not only the prerogative of scientists but of any intelligent person. However, there are ridiculous mistakes and typos even in the publications of scholars. When analyzing the text, pay attention to the smallest details. Check the spelling of difficult words. Examine the relevance of the use of this or that terminology. Focus your attention on punctuation too. Many people do not attach much importance to the rules of punctuation. However, they have a much larger role than it might seem at first glance. Punctuation marks can change the meaning of a text, make it more difficult, or vice versa, easier to understand. It is known that all publications should be written in a scientific style (in some cases it is possible to use the popular science style). However, some articles are very boring, while others are very interesting to readers. It is all about the author's style. Any text can be interpreted in different ways, even within the same style of speech. For example, the author may simply demonstrate the facts, which is very boring. However, at the same time, if the writer adds some relevant additions or examples from everyday life, his or her work will become more memorable. Many people who are not related to science find scientific texts very complex. In fact, the success of the publication lies in its simplicity. This means that the use of simple sentences is more appropriate in such articles. If the author wants to make some kind of clarification, he or she should not be limited to commas for its highlighting. As you know, brackets and dashes can cope with this task better, as the highlighted text will become more noticeable. All previous recommendations concerned the text of the article being analyzed, and this advice applies to your review. It must be remembered; if you decide to criticize someone's work, you must show very good writing skills. Otherwise, your criticism may look ridiculous and have no scientific value. Pay special attention to the structure of the text. Remember, any paper should consist of three main parts (introduction, the body of the text, and conclusion). All of them must be interconnected. Divide your text into paragraphs. Each paragraph must express a single idea. If your article is quite large, divide it into several points. Think about headlines for each of them. Work on the text responsibly. Do not try to claim the merits of other scientists. Analyzing this or that article, do not copy the statements of other critics. First, they are very often well known, and an experienced professor can easily understand that you have done such a trick. Second, any text is automatically checked for plagiarism, using computer programs. You can use such programs and sites for self-control. If the uniqueness of your article is low, make sure that you wrote all the quotes correctly. Very frequent use of speech clichés can also increase the level of plagiarism in your article. Try to avoid such patterns.